Across the parking lot from Costco in the Ambassador Town Center . The restaurant overlooks the busy intersection of Ambassador and Kaliste Saloom Rd. At BJ's Restaurant & Brewhouse in Lafayette, we understand the value of hospitality, and we look forward to showing you a better way to enjoy your meal out with friends and family. Come for the pizza that made us famous, our handcrafted beer that continues to earn prestigious awards year after year, or a good place to watch the game with friends. Beyond our dedication to serving customers with the highest quality food, service, and beverages, we are also proud to be an active part of our community in Southern Louisiana. Before becoming one of the most popular restaurants across the nation, we began as a humble small pizza shop. 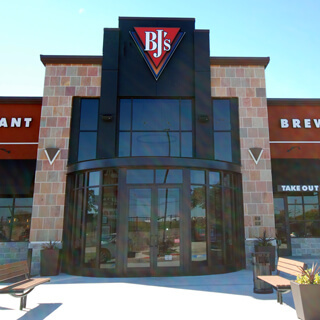 With a lot of hard work and determination, BJ's Restaurant & Brewhouse was born, and we've continued to grow ever since thanks to our constant dedication to customers and quality in everything we do. However, this doesn't mean we've lost sight of what made us famous in the first place. With over 18 signature pizzas ranging from deep-dish to tavern-cut and made to order, you'll have no problem finding the right pizza for any mood. If you're in the mood for something a bit healthier, we're confident you'll find it on our Enlightened menu offering everything from salads to entrees, and sandwiches. Those looking to satisfy a serious hunger will certainly want to look at our handcrafted burgers to include the Hickory Brisket and Bacon Burger. We also have a kids' menu that satisfies even the choosiest eater. When time comes for dessert, treat yourself to our world-famous Pizookie®, available in a wide variety of flavors. At BJ's Restaurant & Brewhouse, we're all about flavor and known for beer. Our experience in craft beers goes back over 20 years, and we think you'll be just as impressed as we are at the results. On tap, you'll find 11 award-winning beers and cider or choose one of the over ten rotating seasonal beers. Thanks to six breweries spread across five states, you can always count on a fresh brew. While you enjoy your beer, consider buying a beer for one of our local heroes in education. Being a part of our community is one of the most important parts of who we are at BJ's Restaurant & Brewhouse in Lafayette. There's a good chance that you'll find our team members volunteering at various charitable events, to include Habitat for Humanity and BJ's Foundation that focuses on the health and education of future generations. Whether you're taking your family out for a treat, going out to dinner with someone close, or getting together with friends to watch the game, we look forward to serving you at BJ's Restaurant & Brewhouse. We're conveniently located at 4511 Ambassador Caffery Pkwy, Lafayette, LA 70508. We have made BJ's of Lafayette the newest place to watch the Saints and bring the family. We have adopted the Lagniappe Way of Louisiana, something given as a bonus or extra gift.